BERKELEY — “Topaz Stories: Personal Experiences Before, During and After E.O. 9066” will be presented by J-Sei and Friends of Topaz on Saturday, March 12, at Berkeley Methodist United Church, 1710 Carleton St. in Berkeley. Registration and refreshments from 9:30 to 10 a.m.; program and Q&A from 10 to 11:30 a.m.
Frank Kami and Yaeko Kami Yedlosky, consultants for the barrack display at the Topaz Museum in Delta, Utah, will share their stories. “Before we went to Tanforan, my (citizen) siblings and I were allowed to stay in our home, but our (alien) parents were forced to leave because our University Avenue address was inside the military restricted zone,” Yedlosky said. Tim Kawakami, San Jose Mercury News columnist and Topaz descendant, will narrate the Kami family story. 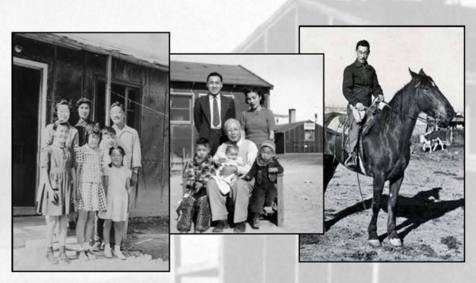 Arlene Tatsuno Damon, daughter of Dave Tatsuno, will share stories about her father, whose famous home movie that documented his life in forced exclusion in Topaz was accepted into the Library of Congress National Film Registry in 1996. For more information on the Topaz Museum, visit http://topazmuseum.org/.